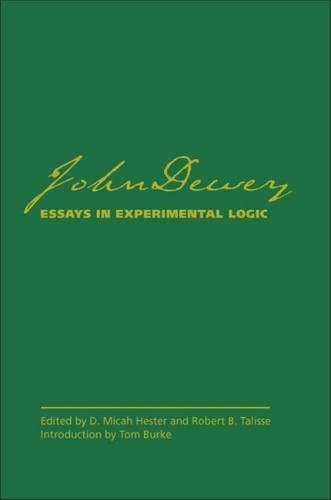 This critical edition of John Dewey's 1916 collection of writings on logic, ""Essays in Experimental Logic"" - in which Dewey presents his concept of logic as the theory of inquiry and his unique and innovative development of the relationship of inquiry to experience - is the first scholarly reprint of the work in one volume since 1954. ""Essays in Experimental Logic"" edited by D. Micah Hester and Robert B. Talisse uses the authoritative texts from the ""Collected Works of John Dewey, 1882-1953"" (published by Southern Illinois University Press) and includes articles from leading journals representing various contemporary schools of philosophy, whose members critiqued Dewey's experimentalism. Culling material from six volumes of the chronologically arranged Collected Works, this single-volume edition of Essays marks a crucial point in Dewey's intellectual development: one in which Dewey critically engages idealistic and intuitionist theorists and lays the groundwork for his mature theory of inquiry. A new introduction by renowned Dewey scholar Tom Burke places Essays in philosophical and historical context. ""Essays in Experimental Logic"" also features five critiques by Dewey's contemporaries - Bertrand Russell, Wendell T. Bush, R. F. Alfred Hoernle, H. T. Costello, and C. S. Peirce, plus textual commentaries and a bibliography of secondary materials on Dewey's essays.